While covering the 2015 Academy Awards, the increased interest of film, among the younger generation was a topic of conversation. That's natural in a town, like Los Angeles, that's packed to the gills with film students and aspiring thespians everywhere you look. Hollywood is a company town and business is booming despite the many exciting platform changes, the desire to create and make movies will never diminish. It's storytelling and we've been doing that, "collectively" since the cave people huddled around a roaring fire and shared about their fears and dreams. In full disclosure, which is my nature, while covering the Oscars, this year, I was most excited about TEAM OSCAR (in it's third year) than I was about rubbing elbows with the famous and glamorous. The Academy is packed with people who make things happen. Not idle talkers and one way they show their support for developing talent s with the Student Academy Awards. 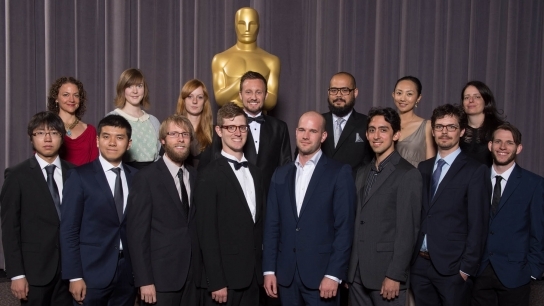 Good news, the Academy is now accepting entries for its 2015 Student Academy Awards competition. All Student Academy Award® winners become eligible for Oscars consideration. The 42nd Student Academy Awards presentation will be held on Friday, September 18, at the Academy’s Samuel Goldwyn Theater in Beverly Hills. Complete rules and a link to the online submission platform are available at www.oscars.org/saa. The Student Academy Awards U.S. competition is open to all full-time undergraduate and graduate students whose films are made within the curricular structure of an eligible accredited institution. In the Foreign Film category, eligible schools are allowed to submit one film to the competition. The deadline to submit entries is Monday, June 1, 2015. For a list of eligibility requirements, visit www.oscars.org/saa. The Future of Film is Here!! Team Oscar 2015 Talks to myNewYorkeye! The Academy of Motion Picture Arts and Sciences continues to make investments in the future of the industry and one of the best places that demonstrate that sincere effort is expressed in Team Oscar. What the Academy is doing is an amazing thing — to me— because it’s an investment in young storytellers and despite this being an over used cliche— the future is now! “Now" is Team Oscar 2015 and despite this just being the third year, it’s quickly becoming a “new" Academy tradition. The 2015 Team Oscar winners are Chris Carmona – Hometown: Bell, CA; Justin Craig – Hometown: Ballston Spa, NY; Kelly FitzGerald – Hometown: Geneva, NY; Justin Floyd – Hometown: Compton, CA; Rhianna Shaheen – Hometown: Virginia Beach, VA and Patrick Walker – Hometown: Atlanta, GA. They were all selected by Oscar producers Craig Zadan and Neil Meron, the Academy and Channing Tatum who unveiled the winners on “Jimmy Kimmel Live” last month. The “lucky six” have boarded United Airlines (the official airline sponsor of the Academy and of the Oscars telecast) and will have an an opportunity to explore the renowned collections at the Academy’s Margaret Herrick Library, tour motion picture studios, and participate in meet-and greets-with film-makers at Oscar Week events. When covering the 2014 Oscars, I connected with Team Oscar and was impressed by the young storytellers and how the program was being shaped. Q: Patrick Walker – (Hometown: Atlanta, GA): If you could pick one director to work with who would it be? If you could pick a single mentor, who would it be and why? Patrick Walker: If I could work with one director I would choose Quentin Tarantino! He is amazing and his risky, gory style is very attractive and artistic! If I could pick a single mentor it would definitely be Denzel Washington because he is one of the best actors of this generation and has paved the way for African American actors like myself and I believe he would give a great amount of information to me seeing as how I am following in his footsteps! Q: Chris Carmona – (Hometown: Bell, CA): Why do you want to tell stories? If you could pick one mentor, who would it be and why? Chris Carmona: I personally love storytelling because it’s something I love doing and something I think I'm really good at. I want to tell stories that connect with wide audiences – grounded stories – and present them with characters that they can easily relate to. I’d like the viewers of my films to learn certain lessons so that way they themselves can avoid falling into the same conflicts as the characters on the screen. I strongly believe that all stories contain some type of lesson – whatever it may be. If I could pick one mentor to guide me in my film-making career, I would have to say David Fincher. He’s known for shooting more shots than the average director, because he’s a perfectionist. I know there’s no such thing as perfection but I think we should always aim for excellence. That’s what makes his shots so sleek and so beautiful – not to mention incredibly directed. Q: Justin Craig – (Hometown: Ballston Spa, NY): Why is humor important in storytelling? If you could make one person laugh, at the 2015 Oscars who would it be and why? Justin Craig: To answer your question I would say humor is important because it is universal. A laugh is a laugh in any language. Not only that, but laughter itself brings a lot of lot to people. Storytelling is a way to allow the reader or viewer to escape their own reality for a while. Many times reality can be tough, so humor provides a nice break. As for the second question, that is tougher. I can't think of one specific person that I would love to see laugh. I feel if I can get anyone who is attending the Oscars to laugh, that would give me a great sense of satisfaction as it would allow me to relate to that person, and since they're a celebrity that could be hard otherwise. Q: Kelly FitzGerald – (Hometown: Geneva, NY): Why is a smile important to share? If you could pick one person, at the 2015 Oscar celebration to start the "smile" selfie, who would it be and why? Kelly FitzGerald: My best response to the first question is, why ISN'T a smile important to share? It doesn't hurt anyone, it can make other people happy and you can give and receive endless amounts of them. There is more good than harm from sharing a simple smile. You never know who might need one :) If I could choose one person to start the "smile" selfie it would definitely be Neil Patrick Harris. His happy and charismatic personality perfectly reflects the message I tried to get across in my video. Seeing how successful Ellen's Oscar "selfie" was last year, I am very confident that Neil Patrick Harris would successfully share his smile (and mine) with the rest of the world. Q: Rhianna Shaheen – (Hometown: Virginia Beach, VA): Ext. Outside the Kodak Theater. The screenwriter (you) is poised to enter with five other winners of Team Oscar 2015 and the interior monologue is? Rhianna Shaheen: SCREENWRITER - Heavy Breathing. Shoulders back. Take my picture? Ok. Say Prune?? Sure. Oh, oh, that's Meryl Streep. No biggie. Just one of the greatest trailblazing women in Hollywood. I'm cool. Werk. Werk. Are we almost in?? Let's start the show!